Montgomery County Police say Henry Levi Sanders, a 50 year old man from Landover, MD is in custody in connection with the three cases. Police had distributed surveillance video allegedly of Sanders from Westfield Wheaton Mall. Sanders has previous charges attached to his name as well. All of the recent incidents occurred at the same mall and involved generally older male victims. 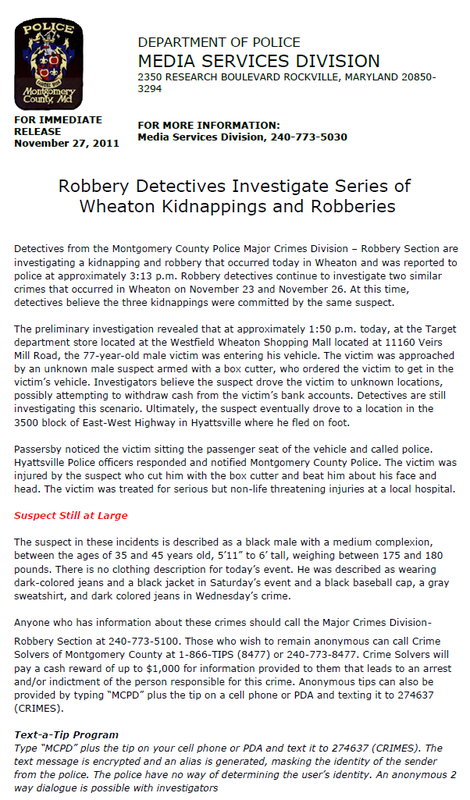 The following document is the press release issued by Montgomery County Police with regards to the recent carjacking/abduction incidents in Wheaton, MD. The only changes that we have made are to remove hyperlink formatting from the top of the press release to eliminate confusion (links cannot be clicked as this is an image file). Continue to check back with The Capital Region Pulse for further updates on this series of crimes. This is the press release from Montgomery County Police with regards to the Wheaton Mall incidents in Maryland. Montgomery County Police are investigating a series of carjackings/abductions that have plagued the Wheaton, MD neighborhood over the last few days. The three cases all involve an older male victim being forced into the vehicle by the suspect. The suspect then forces the victim to travel to various locations and withdraw money from ATM units. The incidents are originating at the Westfield Wheaton Shopping Mall. Detectives do believe that the same person is responsible for at least the first two incidents. The third that occurred on Sunday is still under investigation. Police have issued a lookout for an African American man with a medium complexion, between the ages of 35 and 45 years old, 5-foot-11 to 6 feet tall, and about 175 to 180 pounds. Obviously, if you spot a person that you think is the suspect, you should not attempt to take action. Call police and give them details on direction of travel, clothing description etc. Also, people in the area should be aware of their surroundings. The Capital Region Pulse will be posting the Montgomery County Police press release for viewing shortly. Stay tuned for further updates and details on this developing crime spree.